LOUISVILLE, Ky - That roar I heard as I walked along the 18th hole at Valhalla Golf Club was more than likely a Tiger Woods birdie at the 16th. I had set out to intercept the marquee grouping: Woods, Phil Mickelson and Padraig Harrington. They were playing Valhalla's back nine first, and then would head over to the 1st tee. As the PGA of America might say, this was major. Tiger and Phil were playing together for the 32nd time. A lot of people would be following along. I was going to join the crowd. But first I encountered the grouping of Adam Scott, Lee Westwood and Jordan Spieth. Westwood would go on to the early first-round lead, shooting a 6-under 65. Then I saw the 19th grouping--Jimmy Walker, Ian Poulter and Jason Day--on the 18th tee. All three players hit good tee shots on the finishing par 5. Here they come. Tiger. Phil. Padraig. What they're wearing: Tiger, purple over gray. Phil, white over black. Padraig, blue over white. Being 6'4" helps, just a little. Yes, I'm media, but I don't have inside-the-ropes access like some do, so I'm one of the sardines in the large gallery. That's what it says on the green bibs worn by volunteers who bark at gallery members as Tiger, Phil and Padraig made their way to the 18th tee. "Sir, put your phone away!" And more commands like that. The three major winners teed off. In a fairway bunker, Tiger was unhappy. Flirting with the water down the right side, Padraig was worried. Phil was satisfied because he was in the fairway. Only Phil birdied the hole. Harrington was 1 under, but otherwise there wasn't much happening in this group. 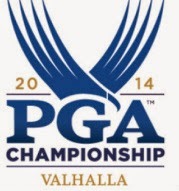 At 7,338 yards, Valhalla is playing 100 yards shorter than its official yardage on Thursday. The 1st hole is 432 yards. Padraig and Phil split the fairway, but Tiger snapped his drive deep into the left-hand trees. More visible unhappiness. Tiger was on his way to a 3-over 74. Harrington would card a 73. Mickelson was destined to be low man of the group with a 69. While I was out there, I conducted an impromptu, random and very small survey. I asked golf fans, "Tiger or Phil?" Which one do they like best, or pull for, if they had to choose. It's a simple question, really. One that almost anyone could answer, although a few people were mildly suspicious. "How are you going to use this information?" asked one man. Tiger edged Phil in my poll, 12 to 8. One person suggested that I do "Tiger or Rory?" Maybe I'll ask that tomorrow.